The good: Today is my last day of work until 2012! I've taken 2 weeks off at Christmas for the last 3 years & it does wonders for my mental state. I'm determined to start 2012 off on the right foot. The bad: I am absolutely exhausted, physically & mentally, and I have a LOT to do between now and early Sunday morning, and I'm totally freaking out about how I'm going to muster the ability to get it all done. The mixed: I say early Sunday morning because that's when I fly out of Oakland for 3 days visiting my grandma & uncle in Boise. I love visiting them, and I love them and I don't see them enough, but this will be the first time since 2004 that I've gone to visit them by myself (Scott is staying home because we could only afford for one of us to go). I am really sad about going alone and my heart hurts. The good news is that I get to meet the new puppy, Max (note: Max is a 10 month old who weighs 10lbs more than I do, so "puppy" mostly means poorly behaved, not small), so that should provide a distraction from missing my husband. Perhaps needless to say, I am now in full blown pre-travel panic mode. Blech. I can't wait until I am back and get to start going to the gym daily & revving up to the new year; but at the same time, I am being careful not to think that way. Living in the moment > living for the future. 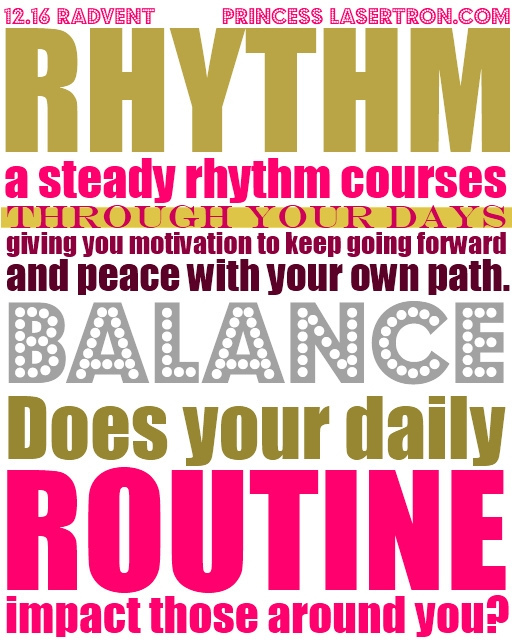 Ah, balance & rhythm. Another theme in my life, as I was evidently born with zero natural ability to apply either of these principles of my life for an extended period of time. It's something I actually never thought to try until a few years ago; yes, that's actually true. I've managed to do pretty well in life for someone who refuses to keep a schedule, a to-do list & seems allergic to routine, but lets face it: adult life = responsibility, and eventually a fly-by-the-seat-of-your-pants mentality catches up with you. It sure did with me. It is only within the last couple of years that I've really tried to instate some kind of order in my life. Because, you know, it doesn't just impact me. It has an effect on everyone else I interact with. It's only fair! I tend to feel like I'm doing well if I am making some kind of progress over time, and have a plan for what I'd like to accomplish. This year I began keeping a detailed to-do list & calendar, which helps me keep track of things (I like to think that I can somehow remember everything, when in fact my short-term memory is selective and tends to forget the important things) and gives me a good idea of what still needs to get done. As much as I hate to admit it, an Amber who adheres to a routine is a happier Amber. I've learned just how much this year, as I've had several periods where I've been "doing everything right." Unfortunately, I know just how hard it is to get it back after slipping up even for one night. It's always a process. I want my winter break to be productive & nourishing. Good for body & soul. ** Blog dividers courtesy of Jess at IROCKSOWHAT.